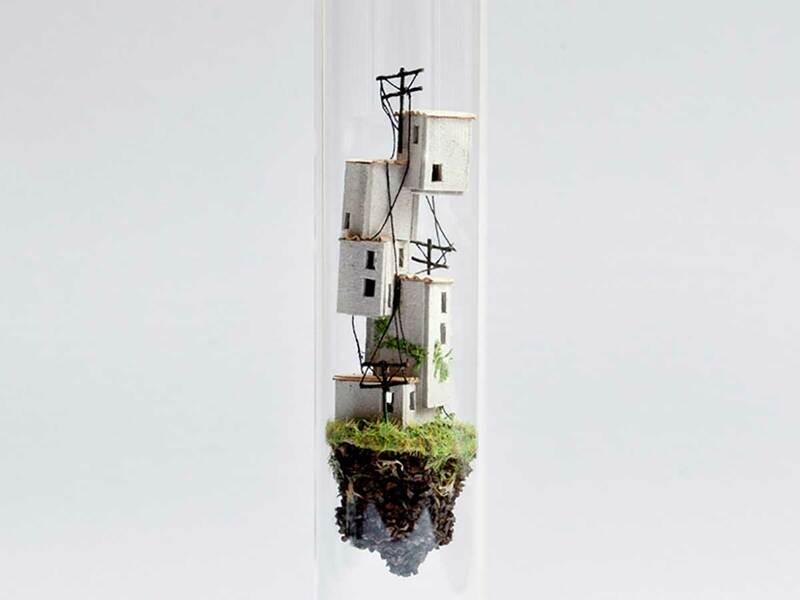 A tiny twist on miniature architecture turns simply-crafted models into hovering micro-habitats, suspended in test tubes like the science experiment of some architect. Micro Matter is an ongoing project series by Rosa de Jong, an artist and designer from Amsterdam who uses both manufactured materials (paper and cardboard) as well as natural ones (sticks and moss) to shape small worlds enclosed in glass. Skyscrapers and elements of nature to fit inside bottles. The scenarios range from partial (the tops of skyscrapers poking above the clouds) to complete (homes resting on floating mountaintops), and vary in structural plausibility as well, bringing to mind less-controlled urban environments in places like Mexico, where ingenuity often trumps order. Each creation also comes with a behind-the-scenes look at its construction, including both the materials employed and the tools used to cut the pieces apart and assemble them into new forms. Micro Matter: Vertical dwellings in glass test tubes. The results strike a balance between everyday believability – crooked walls and as-needed staircases – and utter unreality, combining the rigor of a ship-in-a-bottle with the thought of a science fiction artist. Perhaps comparable to a ship in bottle, the little houses and buildings are all handmade using natural objects and some model making elements like faux moss. Some pieces even play with gravity.